Westminster is known for its wide variety of cultural, entertaining and innovative museums, heritage sites and educational establishments. The Tate, the National Portrait Gallery, and the Churchill War Rooms are just a few examples. Westminster’s institutions are also known for their clean and presentable environments that continually create a welcoming first impression for visitors. We can help you to maintain this high standard of presentation with a number of services all around waste management for Institutions and Museums. How can we help you effectively manage your establishment’s waste? 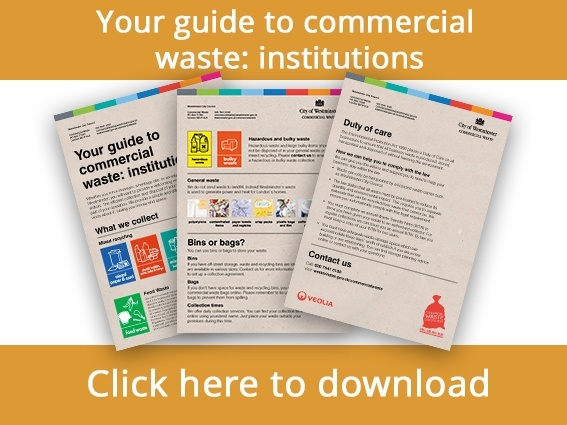 Westminster City Council’s Commercial Waste Service has created a helpful guide specifically for this sector. The guide tells you all about our simple and efficient waste collection and disposal services. What waste does the service collect? How should the waste be stored prior to collection? Where does the waste go? Is the waste reused and disposed of with care for the environment in mind? 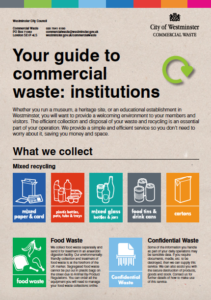 The new, clear and informative guide is aimed at helping you manage your site’s waste more efficiently and conveniently. Effective waste collection will maximise the potential of your Institution, as well as collectively strengthening and improving Westminster as a major visitor destination. The guide informs you of the key waste ‘do’s’ and ‘dont’s’, such as information on confidential waste and how to dispose of it securely. The guide also covers the different categories of waste and how each category is disposed of differently. Why Westminster City Council’s Commercial Waste Service? In delivering commercial waste services in a responsible and professional way, we place the waste management needs of your organisation at the heart of our service to you. Our advice is also based on substantial experience. Every year, Westminster City Council collects over 195,000 tonnes of waste, enough to fill 24,000 double-decker buses. In addition we look after the clean-up after some of the largest events in the UK within a matter of hours. You can reduce your organisation’s carbon footprint as well by using our services. This is because the regional carbon targets set on Westminster City Council for handling waste are a lot more stringent than those of any other waste collector. Together with our rich variety of clients, this makes us one of the most flexible, reliable, sustainable and cost-effective waste collection services in the UK. Follow the link below to read more and to ensure that your institution maintains a welcoming environment for visitors and staff alike. Further questions? Contact the team by filling out this contact form.